It's hard to imagine rolling green pastures beyond city lines when surrounded by crowds and concrete, but at Bateau, the elements of wide open spaces are on display for the discerning comforts of city folk. Set in the densely-populated neighborhood of Capitol Hill in Seattle, this bright steakhouse embraces a homespun design that's in keeping with a fresh menu. That was the intention of owners Jeremy Price, Chad Dale, and Renee Erickson, who looked to their property outside of the city — a farm romantically named La Ferme des Anes — as inspiration for the look and taste of their eatery. Erickson and Price's eponymous design firm partnered with Heliotrope Architects and Method Construction for this task, starting with the restaurant's wraparound white siding and walnut floors. Lantern chandeliers and chalk drawings continue that rustic quality, while repurposed slate tables and traditional brass fixtures keep the overall look from getting too kitschy. In the end, the Bateau is a calming blend of both worlds: it has the modernity of city living and the warm approachability of the country. 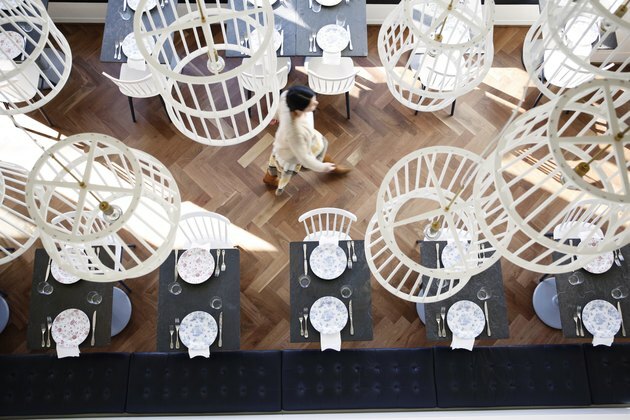 White is the overwhelming shade of the restaurant's color palette, which allows the darker accent colors and metallics to stand out. The whitewashed wood in the dining room is a recreation of siding found on the trio's 20th-century farmhouse. Argent Fabrication was behind the inky leather-upholstered banquette. When thinking about the pendant lights that hang over the main dining room, Price found inspiration from the lanterns and umbrellas that hung in Boat Street Cafe. The white spindles beautifully contrast against the herringbone floor, which is solid walnut with a matte polyurethane finish. 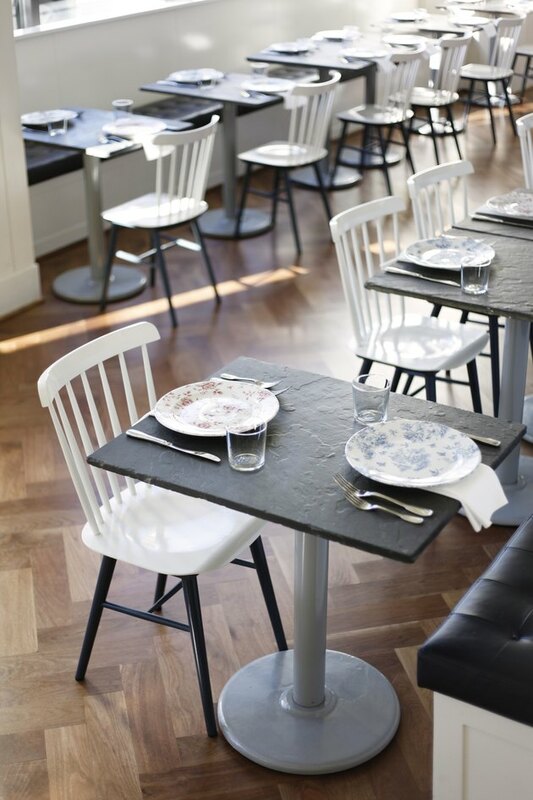 Bateau's dining chairs are the Salt model from Design Within Reach, which are repainted in "Serpent" by Sherwin-Williams. 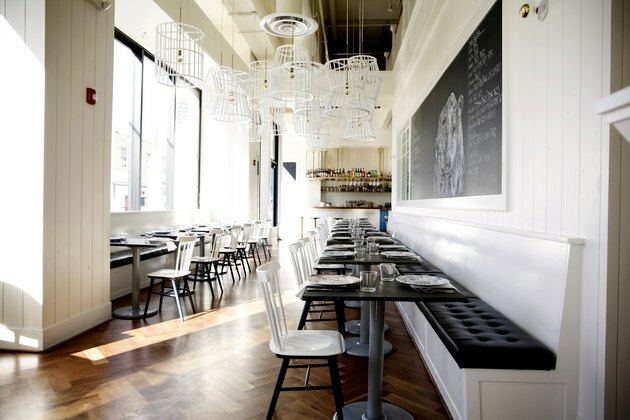 Price also repurposed the 20-year-old black slate tables from Boat Street Cafe for this restaurant. 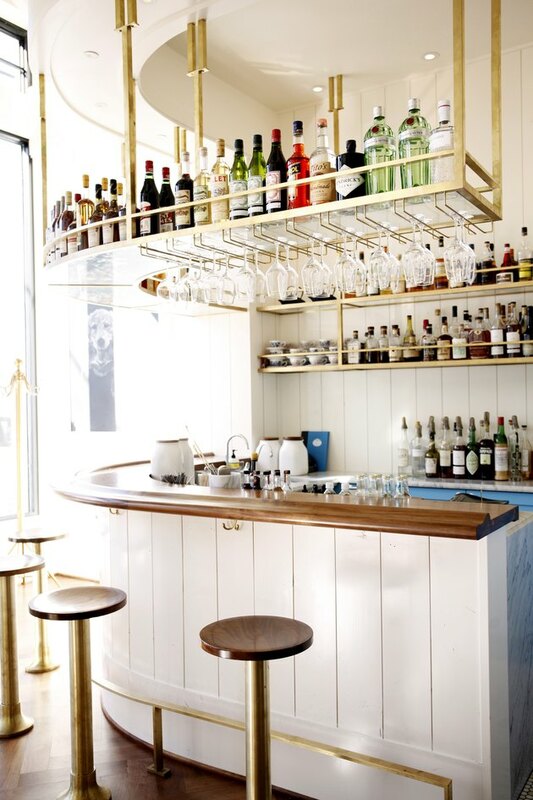 The daylight that streams in from the plate-glass windows brings out the sparkle in the bar's metal details. It's the perfect balance to the white siding and the dark wood of the counter and stools. 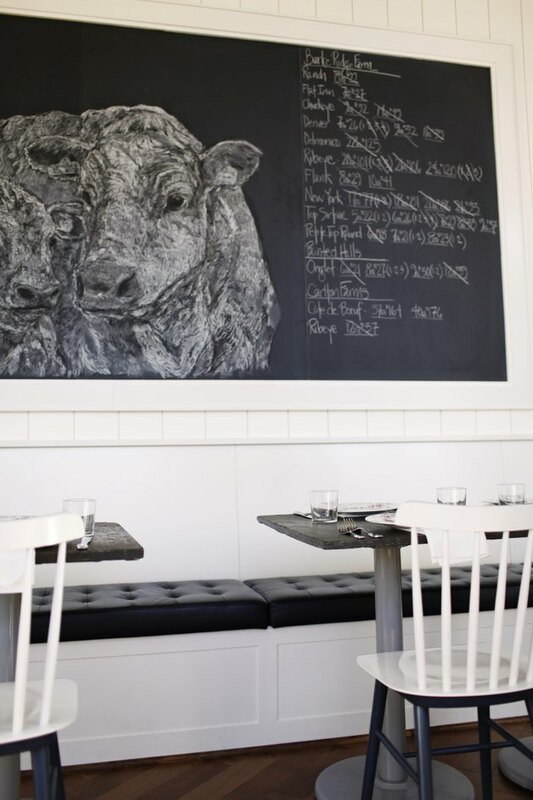 The chalkboard cow — whose likeness resembles one at La Ferme des Anes — is drawn by Emma Sargeant. In addition to the daily cuts of meat served with special butters, the menu features dishes like smoked octopus and veal sweetbreads.